Please do not forget to mention the item number when ordering or inquiring about this wedding ring set. The butterfly and the hawk. Being somewhat paradoxical metaphors of, on the one hand, nimbleness and carefreeness and on the other hand strength, persistence, and vision, these winged creatures symbolize the love between two people. Love has two sides: serious and solid, and also playful and vulnerable. 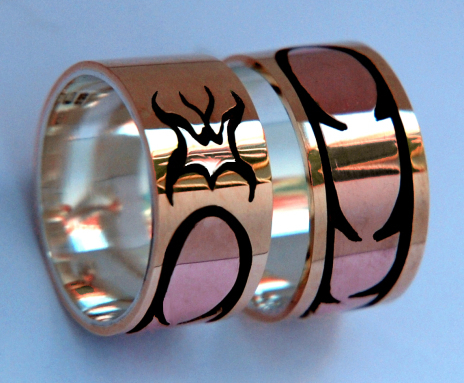 The stylized hawk feather featuring both wedding bands represents the first two features, the inlaid butterfly the second.